We came, we saw. We took in an industry party or two, and rode more than ever. Motorcycle USA kicked off Bike Week 2014 with a spin on Harley’s two latest offerings, the 2014 Low Rider and Super Low 1200T. Debuting them in Daytona Beach was only fitting seeing how the first Low Rider was introduced there as well back in 1977. Harley brought back its popular Dyna with a host of upgrades, including a stompin’ Twin Cam 103 engine and big dual discs up front. On the Super Low, Harley compressed the rider’s triangle of the Sportster and gave it a tall windscreen, saddlebags and floorboards for light touring duty. Find out more in our 2014 Harley-Davidson Low Rider First Ride article and be on the lookout for a first ride review of the 2014 Super Low 1200T in the near future. A couple days later, we’d meet up with our friends from Harley-Davidson again for its annual Ride-In Custom Bike Show. Both Willie G and son Bill Davidson showed up to greet fans and host the awards ceremony. The trophies were collectible custom-painted helmets by Atomic Bob of Atomic Dice Studio Arts. Harley owners competed in eight classes, from Pre-1948 to Trike/Sidecar. It’s amazing to what extremes people can take their Harleys, from ratting them out to building big, bad baggers. But nobody took it to more of an extreme than Quebec’s Christian Rivard, winner of “Best of Show” honors for his stretched and slammed super radical. Almost every inch of his bike called “Spartacus” has been customized, a fact that helped him gain favor with judges. Get all the details, see the list of winners and check out the bikes in our video courtesy of our Harley Bike Week Ride-In Bike Show 2014 report. Looks like she’s channeling her best Miley Cyrus. It seemed like everywhere we went, Jay Smith was there reppin’ the Rat’s Hole. The venerable Willie G Davidson was a special guest at the 2014 Harley-Davidson Bike Week Ride-In Custom Bike Show. days later we picked up a 2014 Indian Chief Classic ourselves and made a day trip over to the oldest establishment in the US, St. Augustine. The city’s history dates back to 1565, and is filled with plenty of old world charm. We rumbled around town on the big red Chief while taking in as much of its ambience as we could. We went on a treasure hunt searching for a piece of personal history, making the trip that much more magical. An incredible day on an incredible machine, come along for the ride in our Chasin’ History on the 2014 Indian Chief Classic article. We also got a chance to ride the 2015 Victory Gunner while we were there. Victory threw it’s 1731cc Freedom 106 V-Twin into the lightest chassis it offers, dropped the seat, and added beefy wheels to its latest cruiser, creating the type of bike you want to ride fast and hard. We took a jaunt out to De Leon Springs State Park, a natural spring with a long history, from sugar mill to resort destination. Explorer Ponce De Leon believed its pristine waters might be the fabled “fountain of youth.” We had brunch at the Old Spanish Mill Grill and Griddle House located in the park, a unique eatery with griddles built into tabletops where you make your own pancakes. After brunch, we kicked up our stands and spun the wheels of Victory’s latest cruiser around Daytona Beach, unleashing the power of its potent V-Twin at every opportunity. We saw another cool Victory out at the Speedway at the Allstate Insurance display. Custom builder and Strokers Dallas owner Rick Fairless worked his magic on a Victory Vegas 8-Ball to serve as this year’s Allstate Insurance Sweepstakes Motorcycle. It’s a rockin’ ride as Fairless jazzed it up with sweet engine guards and plenty of drilled-out bits. Best part, the winner gets an all-expenses paid trip to Dallas to brainstorm on a custom paint job for the 8-Ball applied by Fairless and his Strokers team. Allstate also had a motorcycle on display at its booth from one of our favorite builders, Indian Larry Motorcycles. The rigid kicker had a signature chromed twisted downtube and fender struts, an internal throttle to keep the bars clean and an old school jockey shifter to keep rider’s honest. Out at the Speedway, vendors and manufacturers alike were on hand with the latest and greatest motorcycles and aftermarket goodies. Daytona International Speedway is undergoing heavy construction right now, so manufacturers had to squeeze into the Midway next to the vendors this year, and demo rides were moved farther out. Many OEMs offered shuttle rides between the two areas because the demo area wasn’t within walking distance. Getting in and out of the Speedway was complicated too, as cars weren’t allowed inside the Midway and the direct route to Daytona’s infamous Turn 4 tunnel was negated. While plenty of our favorite vendors were on-hand, overall numbers at the Speedway felt down compared to prior years. This wasn’t the story out at Bruce Rossmeyer’s Destination Daytona though. The grounds around the largest Harley dealership around were packed and business was brisk. There was a steady stream of people through Bruce Rossmeyer’s doors, Harley fans gobbling up Bike Week-branded merchandise at a frenetic pace. J&P Cycles has its own permanent superstore at Destination, further incentive to pay Destination a visit. Surrounding them were plenty of big name vendors, from S&S and Baker to Mustang Seats and Performance Machine, while a steady stream of live music and entertainment made for a festive atmosphere. Saturday night the party kicked up a notch as Great White played a free concert at Destination’s outdoor pavilion, preceded by the Miss Destination Daytona bikini contest. The one observation we had from our visit is vendor’s eagerness to close up shop, as by six o’clock most have already shut down operations for the day. We were milling around at this time and there were many people still walking around with more showing up. We understand vendors start early and work long days, but after springing forward Saturday night, shoppers had an extra hour of light and potential sales were out there if shops were open. And then, of course, there’s Main Street. The action seldom stops there as music and mayhem mingle amicably at just about every joint on the strip. It’s a great place to bump into old friends, like we did at the mid-week Cycle Source party at Bad Boys where we saw Chris Callen play a pretty mean bass. Seems like every time we turned around we ran into our buddy Jay Smith of the Rat’s Hole, who always claimed he was out promoting the oldest bike show in Daytona Beach. Catching a set of Hypersona at the Full Moon Saloon has become a yearly tradition, as the big man on lead vocals can really belt out a tune. Motorcycles flood the avenue night and day in a non-stop biker parade. Indian Motorcycle had a huge presence on the strip this year, spending big bucks to splash its name on billboards and buildings all along the street. It even had a retail store on Main Street this year, ironically enough adjacent to the Harley-Davidson shop Bruce Rossmeyer’s recently opened. While Bike Week 2014 felt like it got off to a slow start, our opinions changed when we visited Willie’s Tropical Tattoo Old School Chopper Show. The show was off the hook this year, attracting its biggest numbers in years. It’s no wonder. Willie’s is another place where you always bump into plenty of old friends. Roadside Marty was up to his usual shenanigans as emcee, and plenty of ingenuity and creativity was displayed in the huge showing of custom motorcycles. See what we’re talking about in our Willie’s Tropical Tattoo Chopper Show 2014 report. A constant parade of motorcycles cruise up and down Main Street during Daytona Beach Bike Week 2014. 200 helped bring people in as well. And while the rally had the potential to be a down year, Shelly Rossmeyer-Pepe said she believes their numbers should be up from last year. For the most part, the 2014 rally was a peaceful affair, with Daytona Beach Police Chief Mike Chitwood telling the Daytona Beach News-Journal that arrests for drunk and disorderly conduct were few, and only a few motorcycles were reported stolen. Three fatal motorcycle accidents unfortunately were reported, something we never like to hear, but seems to be an inextricable fact of major motorcycle rallies. 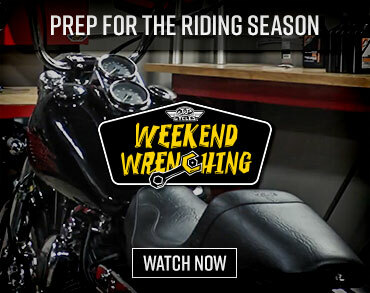 Daytona Beach Bike Week 2014 is in the books, Leesburg and Arizona Bike Week are right around the corner, and the motorcycle rally season has been kick-started in Florida as it looks to shift into high gear for 2014.